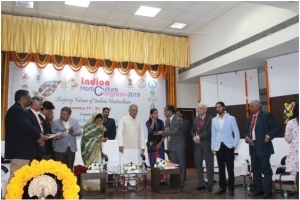 In a grand function of 8th Indian horticulture congress 2019 held at Indira Gandhi Krishi Vishwavidyalaya (IGKV) Raipur, Chhattisgarh on 17th January 2019 two Android based Mobile Apps “eHAAT” and “Custom hiring” have been launched by the Hon’ble Chief Minister, Govt. of Chhattisgarh Shri Bhupesh Baghel in the presence of Smt Sakuntala Sahu ,MLA, Govt. of Chhattisgarh, Shri S. K. Patil, Vice-Chancellor, IGKV and other dignitaries. From NIC, Chhattisgarh Shri D. K. Debnath, SIO Chhattisgarh accompanied by Shri Y.V.S. Rao, Scientist-E and Shri Abhijeet Kaushik, Scientist-B was present on the occasion. The Mobile Apps have been developed by NIC Raipur. e-HAAT is the online Agri-Market where farmers can buy/ sell or advertise fruits & vegetables, agriculture produce or any agriculture machinery, Tools or Tractors etc by fulfilling the dream "Tol Mol Nahi - Sabko Milega Sahi Mol". The major goal of this mobile app is to act as a catalyst by providing a web based marketing platform to the farmer’s especially small, marginal, medium and land less to directly sell produce to the buyers. Farmers (Kisan) can sell their produce directly to end consumer. It is 100% free for farmers. Buyer can search product based on categories and distance. As and when any farmers/seller uploads the product for sale, the app notifies the same. With this in place the role of middlemen is eliminated. 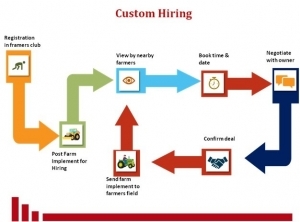 Custom hiring (with e-Haat) - a mobile app based aggregator platform which facilitates hiring of tractors and modern farm machinery for farmers in Chhattisgarh. App is free and connects Custom Hiring Centres (CHC) operated by tractors and equipment owners directly to farmers who need farm mechanization services and solutions, thereby facilitating a fair and transparent rental process while focusing on quality, dependability and timely delivery.